Fear seeks safety. Love seeks Truth. Please read and enjoy. Productive, truthful feedback welcome. On a hiking trip near Boulder, Colorado, I snapped a picture of the above sign. Several life changing events have occurred on this globe as a result of being curious. Being curious is allowed. Visitors are encouraged to stray from the trail. Lessons in the creek of discovery are deceptively swift, powerful and exhilarating. Venturers are regularly given second, third, fourth—seemingly innumerable—chances. 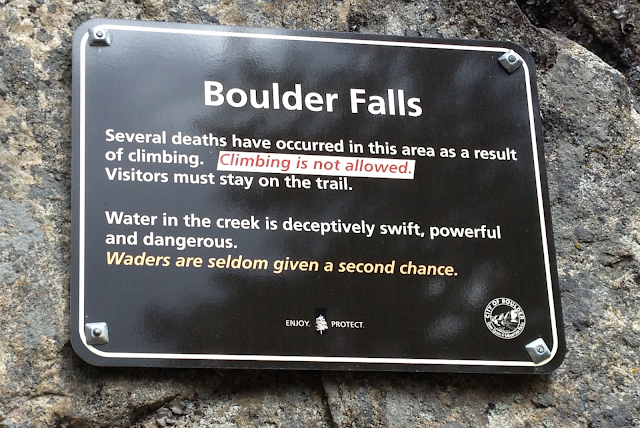 When at places like Boulder Falls, be forewarned. When on the rest of Earth, be curious. CHECK OUT The Bottom Turtle ~For musings from Dave on how to Love More and Judge Less link to his new book. Imagine that everything we ever hear or receive will be great news. Nothing bad to hear. Nothing bad to report. A wise man once said he always reads the sports section first: It celebrates mankind’s successes. The front page reports only man’s failures. What if we never go to the metaphorical front page at all? What if we decide the front page is not really news, but merely dressed-up gossip? What if we don’t look at people or events as failures at all? What if, instead of seeing failures, we see only differences? Differences that we choose to see as just one more ingredient in the complex global stew of cultures and habits and quirks and personal situations or unavoidable outcomes that has become our world. What if we move beyond the gossip, beyond the front page? What if we really want to lift up others instead? What if lifting others up is our sole motivation for everything we do, everything we say? What if we extend to others—ALL OTHERS—the grace we hope they will extend to us? What if, in grace, we have nothing bad to say? Nothing bad to hear? What if our heart is so full of grace—so full of charity, so full of love—that our words and our actions toward all others are only positive, only uplifting? What if everyone does that for each other, for all others? What if it starts with us? All the news you receive will be positive and uplifting! Okay, here's my weekly Thursday post. I spent hours crafting Plan A. It didn't save. It reverted to my original draft. I normally create in Google Docs. Tonight I created in Blogger. Too late to reconstruct tonight. Too late to create a new one. It was about the Household pitcher. It was pretty good. In fact, really good. I wrote about how a pitcher fills up and then gets emptied. How it becomes identified by what it pours out, what it shares. Then I compared that to us. We are like a pitcher. We become who we are by what we take in. And we become known by others by what we share or pour out. That’s pretty much what I wrote, but the words were pretty and thoughtful. But now as I write this synopsis, I realize this is all you need. You don't need pretty words and fancy comparisons. You get it. So go, be like a pitcher. Fill yourself with goodness and generously share it with everyone you meet. Happy Thursday. See you next week. l was sitting in my chair by the fire and had just written a letter. I needed an envelope so I ran downstairs to grab one. Some laundry caught my eye. Put it in the basket. Heard the furnace kick on. Was reminded to check whether it was time to change the filter. Grabbed the old filter, the new filter packaging, and other debris from a nearby waste bin. Took them out to the garbage can. Went back into the house. Jobs well done—laundry, filter, trash. Sat back down in my chair by the fire. Chuckled as I walked downstairs to get an envelope. And a stamp! Being present or being sidetracked? Has something like this ever happened to you? I'd love to hear your story. The Bottom Turtle~For musings from Dave on how to Love More and Judge Less link to his new book. For musings from Dave on how to Love More and Judge Less, link to his new book, The Bottom Turtle. Dave Driver teaches YOGA and high school science. Dave brings insight, wisdom and humor to his classes and to his posts. Listen. Learn. Love. Mix and match as needed. Reader's feel free to comment. What L words would you add? This is what learning looks like. This is what it feels like!